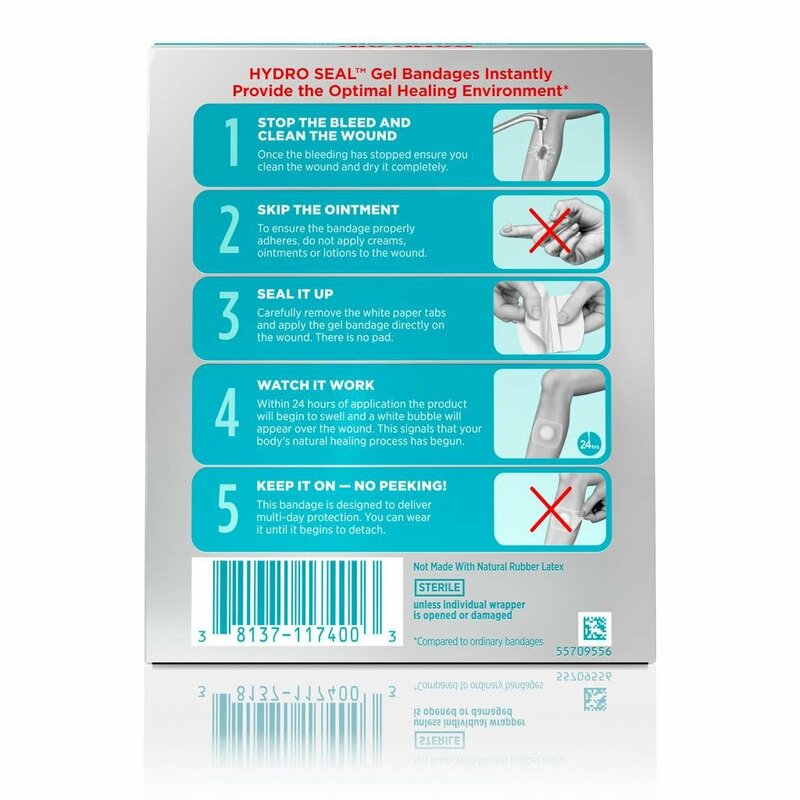 BAND-AID® Brand HYDRO SEAL® XL Bandages help keep germs out and your body’s natural healing power in. Within 24 hours of application, a white bubble will form under the bandage to show that the healing process has begun. These waterproof bandages provide advanced wound care and cushion to help protect blisters. Cushioning provides protection and relief from painful blisters and wounds. Ideal for use on the chest, arms, and legs, the extra-large bandages deliver multiday protection and stay on even through hand washing and showers. This package contains 3 individually wrapped Gel Bandages, each measuring 2.44 by 2.75 inches. 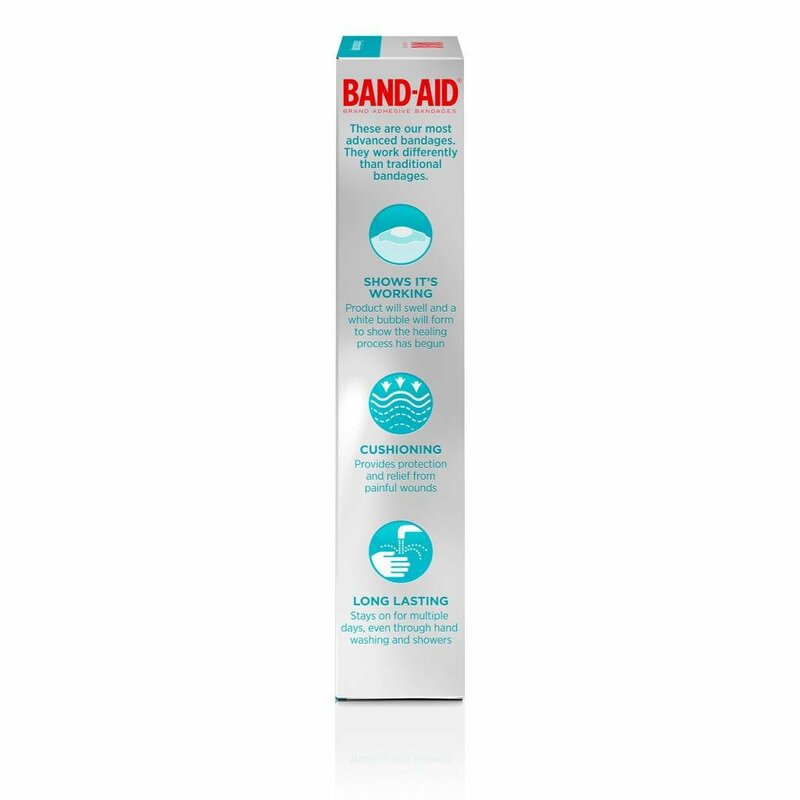 BAND-AID® Brand HYDRO SEAL® Bandages, Extra Large 3 Count feature 6 benefits in 1 bandage and provide the optimal wound healing environment! Dual-Action Seal: Helps keep germs out and your body’s natural healing power in! 100% Waterproof: Blocks out water and stays on even when wet. Cushions: Provides protection and relief from painful blisters and wounds. Shows its Working: Within 24 hours, a white bubble will form under the bandage to show that the healing process has begun. Stays on Longer: Stays on for multiple days, even through hand washing and showers. 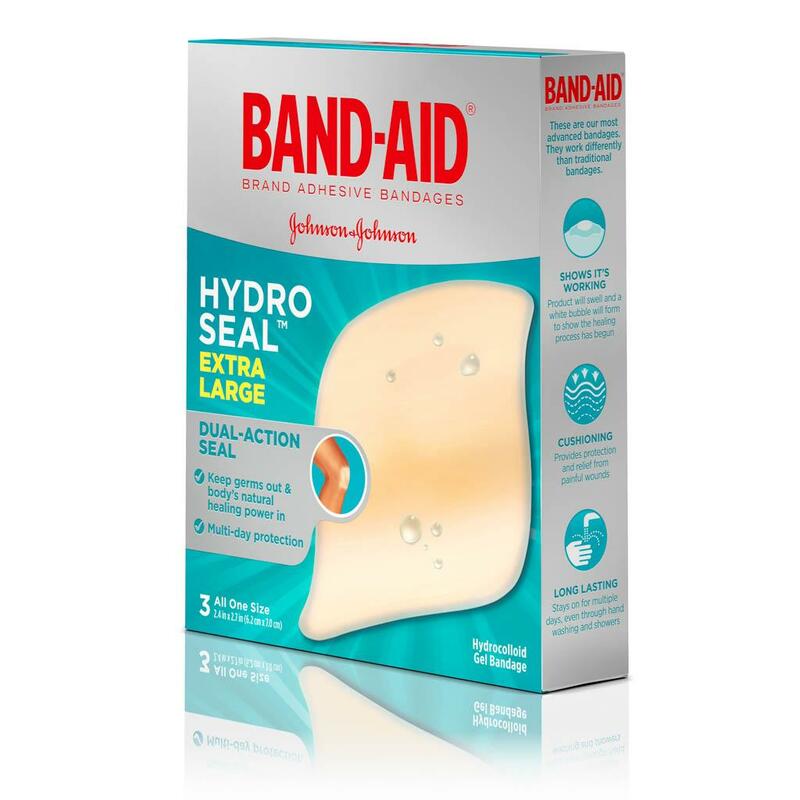 PROPER REMOVAL: Unlike other bandages, BAND-AID® Brand HYDRO SEAL® will stay on for several days. You can wear it until it begins to come off on its own. If removal is required, carefully loosen one end by stretching it along the skin. Do not pull upwards! I frequently get boils , these help to open up the boil allowing it to drain as well as protect the wound left behind. The only downfall is that they get very expensive! Not sure why an economy pack is not an option. At $5 for 3 they are not an option for everyone! I routinely get cuts and scrapes, that just need a good bandaid to keep them clean and healed. These bandaids are GREAT. 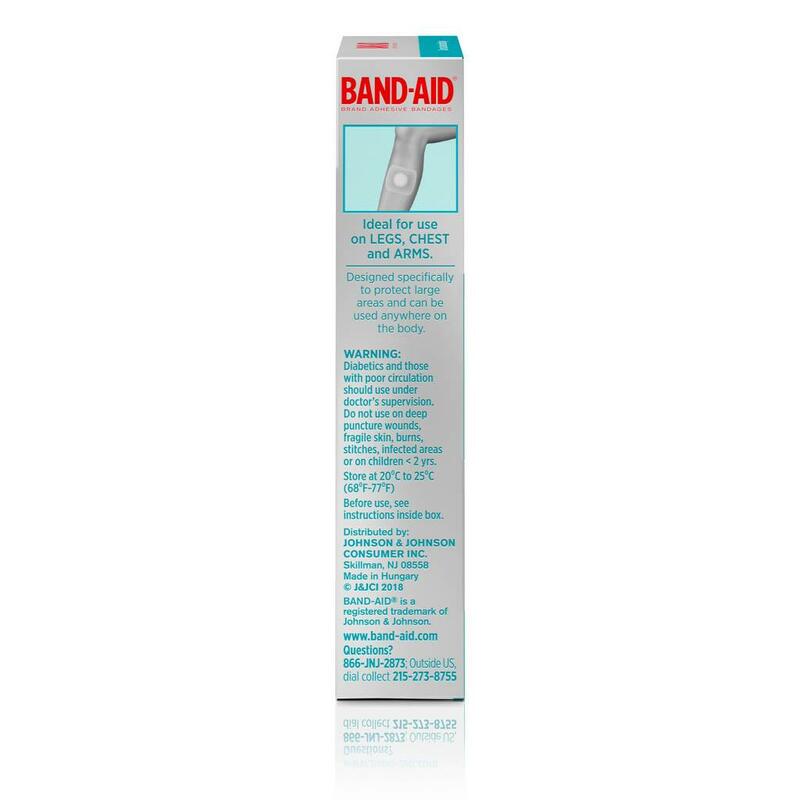 they not only keep the wound area clean and dry, but they stick and stay, better than any other bandaids. I love the white indicator, and knowing when they are ready to come off. I did learn that even on "bendy parts", these pups will stick well, however you have to apply to clean, dry skin and hold for a short period, as if to bond them on. Do that, and it will stay on, even with a skinned wound that typically gets weepy. Now, just make these with a little longer tail for fingers, (why did you stop making the extra long one?) and I won't need any other kind in the first aid kit! I have a large carpet burn on my elbow that hurt so bad. I left it uncovered thinking it would heal quicker but it just stared crusting and it would hurt when I bent my elbow. I put on a regular band aid and that made it hurt even more as it would Rub the wound. So I put one of these band-Aids on. At first it didn’t want to stick to my wound but after a few minutes of me holding it in place maybe like two minutes it stuck perfectly well. woke up this morning pain-free I can bend my elbow as much as I can with no problems I love this. Only thing that worries me is how my wound will heal with all that moisture the band aids traps in. I still love this band aid tho. We want to hear more about your experience with our products. Please give us a call at 1-866-565-2873. We're available Monday-Friday 9AM-5:30PM ET. When you call mention your username to our team. We hope to chat soon! Not for people with sweaty feet! Very promising reviews and was impressed by what the product claimed to do, however after trying 2 boxes I’ve found they are NOT for me! I have extremely sweaty feet, so I am prone to blistering, this seemed like a awesome solution when blisters started to appear. Although advertised to stay on through showers, these don’t stay on me for more that 3-4 hours! I followed directions for application to the T, experimented with 2 boxes, what a waste of money. Sad this product did not live up to the hype! We would expect them to stay on and we would love to learn more. Give us a call at 1-866-565-2873 Mon-Fri, 9am-530pm ET. Hope to hear from you soon! We wouldn't expect this from our bandages! We would like to learn more about your experience. Please give us a call at 1-866-565-2873 M-F between the hours of 9A-5:30P ET. Thank you and have a great day! I put the bandaid on at 10am and by 5pm it was unpeeling. I cleaned the area and dried it before putting on the wounded area. These are expensive bandaids for them not to stick. I definitely will not suggest these to anyone else and I don’t get why they are marketed as being Shower proof. My bandaid couldn’t even stay on without a shower or water running on it. I used this on my arm which is a suggested area for use as well. We're sorry to hear about this, we always expect our bandages to stick! We would like to learn more about your experience. Please give us a call at 1-866-565-2873 M-F between the hours of 9A-5:30P ET. Thank you and have a great day! I went skiing for the first time and while I had special ski socks that were supposed to prevent blisters, I still got one of the front of my leg. I used a heel bandaid and it healed in 3 days! Used it in other cases too and it’s been amazing. Love em! I had a small skin cancer (BSC) removed & no stitches were needed. After 48 hr I removed the surgeon's dressing, washed the wound, and placed a Hydro seal over it. After 3 days the white area expanded enough to leak. I washed and replaced it . This continued for a month. There was no infection but always a spot of blood.The wound made no change for at least the last 2 weeks. Changing to a traditional non stick band-aid which permitted it to dry. In more 2 weeks It no longer had a discharge and no longer needed any care. In the past, using petroleum jelly and changing the band-aid daily. achieved the same result in 2 weeks rather than 6. We'd like to hear more from you about your experience using our bandages! Please give us a call at 1-866-565-2873 M-F between the hours of 9A-5:30P ET. Thank you and have a great day!